The total number of registered pharmacists in Kenya stands at 2,000, but the public and private sector are still in need of at least 6,000 more. This stark need propelled Dr. Nicholas Gikonyo to start the Department of Pharmacy at Kenyatta University in 2009. He had a thorough multi-year plan for its success. The only thing lacking was basic equipment. 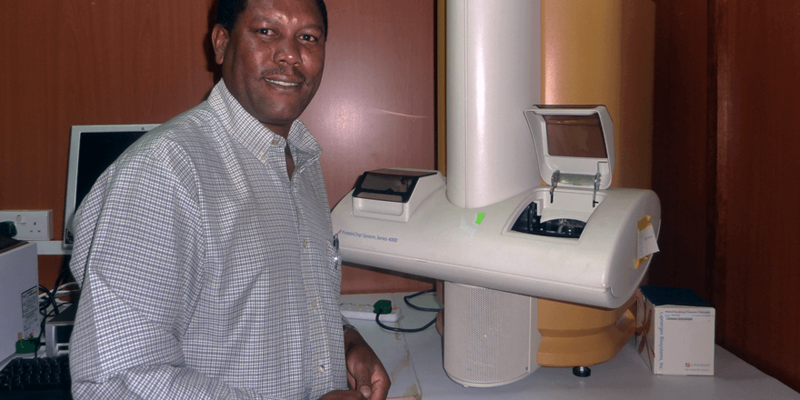 “Down here, even getting small things like test tubes is a big challenge,” says Dr. Gikonyo. In January 2010, Dr. Gikonyo’s first class of pharmacists enrolled in the 5-year program. As their first year began, Seeding Labs sent their department equipment ranging from glassware to a mass spectrometer – enough to fill the labs. The first class of pharmacy students graduated in 2015, prepared to play a key role in building the future of Kenya’s public health system. 87% passed their national licensing exam the first time they took it, outperforming the national average and including the two highest scores in the country. The equipment spurs training, but also research self-sufficiency. “The presence of this equipment has stimulated new horizons of research. Scientists from neighboring universities are visiting us more to see how we can collaborate,” says Dr. Gikonyo.